Small, modern beach house on the sand, quiet,sea view, WiFi, aircon, max. 7 p.
Property 4: Small, modern beach house on the sand, quiet,sea view, WiFi, aircon, max. 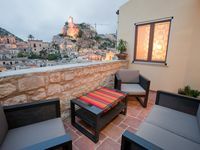 7 p.
Beautifully Restored Heritage Home With A Panoramic View Of Modica Bassa. Property 16: Beautifully Restored Heritage Home With A Panoramic View Of Modica Bassa. Property 18: MOST APARTMENT RENOVATED ONLY 50 METERS FROM THE BEACH! Property 20: Cottage in the countryside in front of the sea. There is absolutely nothing negative that can be said about this property. 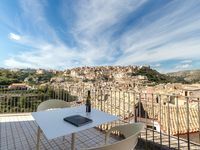 Casa Niria feels very welcoming and comfortable and although we liked exploring the town of Modica, we also very much enjoyed cooking at home and loved the beautiful view from the porch. The house was very clean and is located very close to downtown Modica. The fridge was well-stocked with food and drinks when we arrived. The kitchen had everything needed to cook anything you can imagine, a very nice gas stove and oven, a dishwasher, plenty of pots, pans, plates, utensils, a complete spice rack, and a pantry stocked with essential items. The property manager Giorgio is very friendly and knowledgeable. He had excellent recommendations for restaurants, grocery stores and other attractions. Giorgio speaks both English and Italian and responds quickly to any questions. We loved every minute at Casa Niria!